Home News Events Recording of Live Webinar: Buyer Beware – Are ICOs For You? Initial Coin Offerings (ICOs) are financing mechanisms that have become very popular and controversial. In 2017 alone, ICOs have raised over $1.5 Billion. ICOs are offerings of digital tokens that rely on blockchain technology (similar to Bitcoin). The large majority of ICO investors are private individuals. In the fintech space, ICO funding has surpassed venture funding. Many investors see ICOs as convenient and unregulated investment mechanisms. However, the various regulators, including the Securities and Exchange Commission, have made it clear that ICOs could be subject to regulation as a security. Further, many investors do not understand ICOs as a funding mechanism. What legal protections exist for investors in ICOs? What are the legal concerns for investors in funds that invest in ICOs and digital tokens? 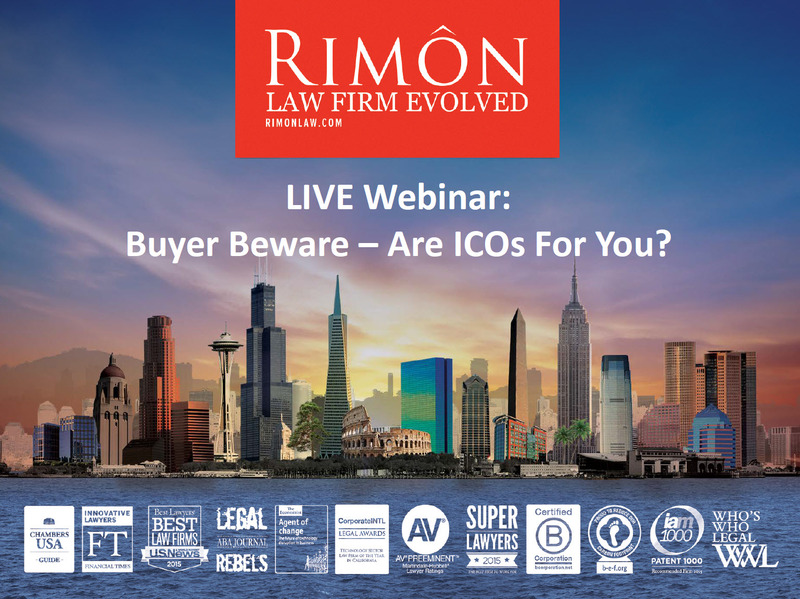 Buyer Beware – Are ICO’s For You Live Webinar Recording from Rimon Law on Vimeo. Mark Diamond concentrates his practice on providing legal and compliance services to investment advisers, broker-dealers and other financial services companies. Mr. Diamond’s practice focuses on the formation of private investment funds and related regulatory issues, as well as the representation of broker-dealers in connection with transactional and regulatory matters. Read more here. Dror Futter concentrates his practice on venture finance and technology transactions. He is advising several companies considering undertaking ICO’s. He is on the Legal Working Group of the Wall Street Blockchain Alliance. Read more here. Marc Kaufman concentrates his practice in the area of patent strategy, in particular, advising clients in protecting, managing and monetizing their intellectual property assets. Marc’s practice focuses on the fintech space and he is Co-Chair of the Blockchain IP Counsel, an initiative of the Chamber of Digital Commerce. Mr. Kaufman has been active in creating procedures to secure and enforce intellectual property rights, as well as structuring and negotiating intellectual property transactions. Read more here.